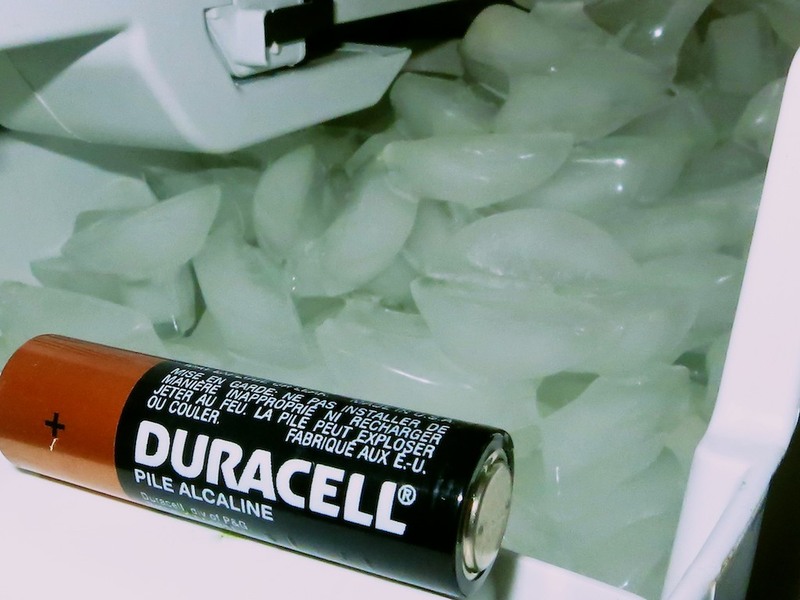 Should You Store Your Batteries in the Fridge? I was at a friend’s party last weekend, and he offered me a beer. He opened up his garage refrigerator to reveal his selection of brews. But before I could spot my bottle of suds, I noticed several AA battery packages hanging out in one of the empty produce drawers. The sight of these batteries sparked a flashback, and I found myself staring into the refrigerator of my childhood. In this 1970’s GE fridge, my parents kept all of our fresh batteries. It was common knowledge in the Lester household that the cold in the refrigerator ensured our batteries could be stored longer without losing their charge. As an adult, I later reversed that theory as poppycock, because we all know that a car battery has a harder time starting an engine during a deep freeze. But now decades later, I again find myself staring at more batteries in a fridge. Question: Does the cold really preserve the charge in a battery? According to howtogeek.com, a battery has a certain rate of self-discharge, and colder temperatures actually slow this rate. However, today’s alkaline batteries lose only about 1% of their charge per month. So it’s not a big deal to begin with. The more important issue is your fridge can introduce moisture onto your batteries. And that can be damaging. So the whole idea of ‘freezing your battery’ to keep it fresh can do more harm than good. Energizer.com has a whole Q&A page on this issue, saying that either cold or hot temperatures will shorten storage life for today’s batteries. But if you keep your unused alkaline batteries at room temperature, you’ll get a shelf life of 5-10 years. Lifehacker.com begs to differ. This writer points to the fact that certain kinds of batteries, like rechargeable NiMH models, self-discharge much faster than alkaline batteries. So chilling them down makes it worth it. Wisegeek.org agrees with this counter argument, but points out you’ve got to warm up your batteries, before popping them into your electronics. Again, it’s the moisture-factor that’s the big problem. So where does this all this leave us? Officially, you shouldn’t put your batteries in your refrigerator. Scientifically speaking though, there is some benefit to doing exactly that. Practically speaking, there’s a real risk that you’ll damage your batteries in your fridge, because of moisture concerns. But if you keep your batteries sealed in an air-tight bag or packaging in your refrigerator, that should protect them from moisture. Well, as with many parts of life, there’s no bulletproof instruction manual. For the record, I will not be storing my batteries in my refrigerator like my parents did. But just as importantly, this all makes me wonder if my parents’ late 20th century batteries had a higher self-discharge rate than today’s more advanced models. If so, that would have tipped the cost/benefit equation back then and explained where all this battery/refrigerator mumbo jumbo came from. So maybe my parents weren’t wrong after all? Hmmm… Another mystery from my childhood explained. Depending on the timeframe of your childhood memories, it’s possible your parents were using batteries of a different chemical composition. In other words, zinc-carbon batteries rather than alkaline. Zinc-carbon batteries self discharge at a higher rate than alkaline. Keeping them cold or frozen helps to slow that process. My grandmother has always stored batteries in her fridge, and I have been wondering what the point of her doing this is. It’s interesting to learn that doing this actually helps extends the life of the batteries, one just needs to make sure to warm them up before use. Having little kids means needing to use a lot of them to keep toys running, it will be nice to not have to change them so often.